The following register reports document six family lines. In order not to make the files huge, these versions do not have the sources footnoted, the latest generation, nor all of the events. If you require the complete sourced version, please contact Eric Stoltz. These registers include the research of Gloria Hernández Alvarado, Phyllis Maercklein, Lysa Nabours, Jim and Margie Schoenfelder, Sandra Springston, Mike Stoltz, Eric Stoltz and Norbert Wegmann. As research continues, these registers will be updated and posted here. Please contact Eric Stoltz at eric@ericstoltz.com if you have any additions or corrections to these registers. At first, understanding a register report can be a bit challenging. I know it took me a while to get the hang of it, so here’s a brief guide I hope will help you to catch on quickly. 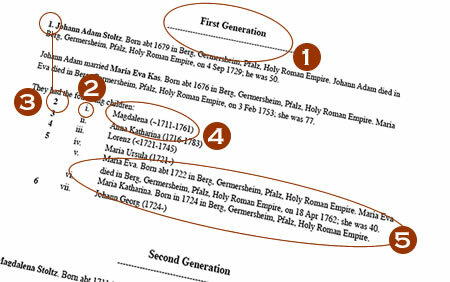 The register breaks down the family line into generations, that is, a set of parents and their children. Each child is numbered with small Roman numerals. Each child with offspring is assigned an Arabic numeral. Look for this number further down in the next generation to find out who they married and the names of their children. The listing under that child’s number will be similar to the one for this generation. If there is more information on a child with his or her own Arabic numeral, only the birth and death dates are given here, as further information is provided in the next generation. If a child did not have recorded offspring, they receive no Arabic numeral and all their vital information is provided here.